I recently picked up this little gem mainly out curiosity. It’s the movie The Exorcist which is synced to Black Sabbath’s album, “Black Sabbath”. I’ve seen plenty of movies dubbed over with psychedelic music in hipster bars but this was something that peaked my curiosity. I get it mostly, but I never put much stock that the music follows the storyline of the film. Sure we all know the Wizard of Oz/Pink Floyd theory but with a enough weed and low IQ, Pink Floyd could match perfectly to four episodes of Dora the Explorer. 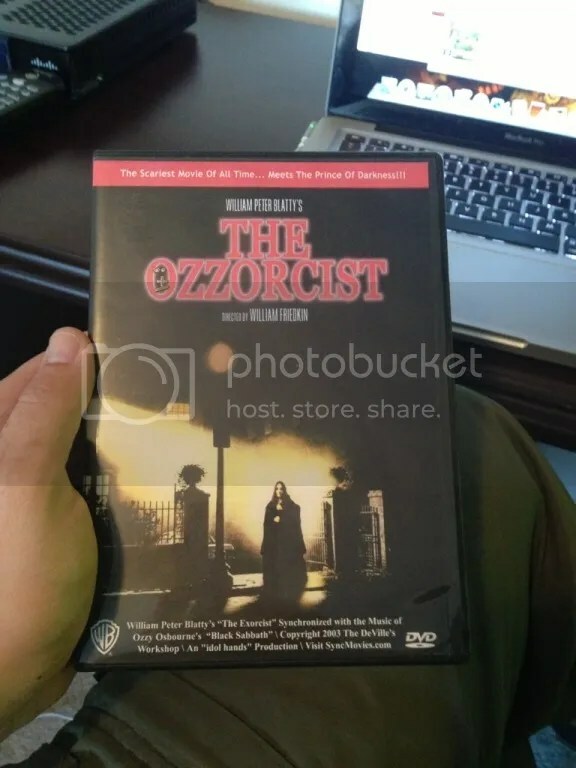 Reading the reviews of De Ville’s musically synched movie, The Ozzorcist, people are generally impressed by how well the lyrics match the scenes. I guess lyrics can be interperated most anyway and Black Sabbath isn’t much of a stretch in relation to a movie that had people believing they were possessed in ’73. To me, this is a match made in Heaven. Shut up, I have no real jokes anymore. Here is a quick compilation I made so see what you think? This is fantabulous. Thanks so much for posting it. I never would’ve known it existed. Solid! Great idea for a post. And I loved the Famous Monster write-up. Did I see a blurb that said that Christopher Lee talked about effing Jaws? I think I could get down with that. I have great memories of eagerly waiting for my monthly issue of Fangoria to show up in the mail when I was a kid. Remember how such a big deal masks were back then? My friend Shannon and I would always make a point of going to Spencer’s in the mall around Halloween and beg our parents to buy us a new mask. It never happened, but we’d sit around and flip through the Fangorias and talk about all the ones we wanted to order. Of course, being 12, we could hardly afford it. It’s awesome to see you on such a quality writing jag lately. Kind of inspires me to actually get something done over at my dusty old blog. That is, if there’s anyone left that would actually read it.